Pour the olive oil into a skillet and set the heat to medium. Once the oil’s hot, add in the green onions and cook just long enough for them to get tender. Add in the spinach, corn, black beans, and lime juice to the skillet. Mix in the salt and ground cumin, taking the skillet off the heat and stirring in the cheese afterwards. Take ¼ cup of the skillet mixture and place it in the middle of an egg roll wrapper. Fold in the sides of the wrapper and roll it up, applying a small amount of water to the wrapper up afterwards. Repeat until the filling is used up. Using a large heavy skillet (we used a Dutch oven), pour in enough vegetable oil to fully cover the egg rolls once they’re in there, setting the heat to medium-high. Once the oil’s hot, place a few egg rolls in at a time, cooking until they look golden-brown all over. Take the egg rolls out and place them on a paper towel-lined plate. While the egg rolls are resting on a plate, make the dip by simply taking a mixing bowl out and stirring the Southwest Sour Cream Dip ingredients together until combined. Serve immediately. Yields 13 egg rolls (could’ve been 14 but we taste tested the filling a few times). This was a delicious combo. We did have to look up instructions on how to roll an egg roll because ours just didn’t look right based off their instructions. This was our first time actually making egg rolls so not all of the egg rolls came out looking pretty but it got the job done. We’ll get better at making egg rolls though, we just need more practice. The egg rolls tasted good on their own and were surprisingly filling but the dip that we thought up ourselves makes it taste even better ! In the dip you’ll taste smokiness and spiciness from the chipotles and adobo sauce and some tang from the lime zest. The cumin also adds some depth to the dip. The spiciness is enough to notice but not overpower the flavors in the dip. 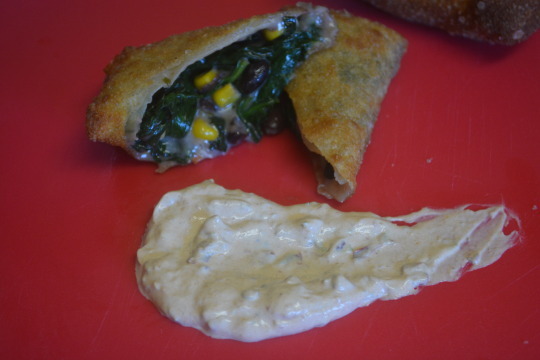 The egg roll recipe came from Allrecipes but the dip was our own creation. We weren’t paid in any form to promote Allrecipes.